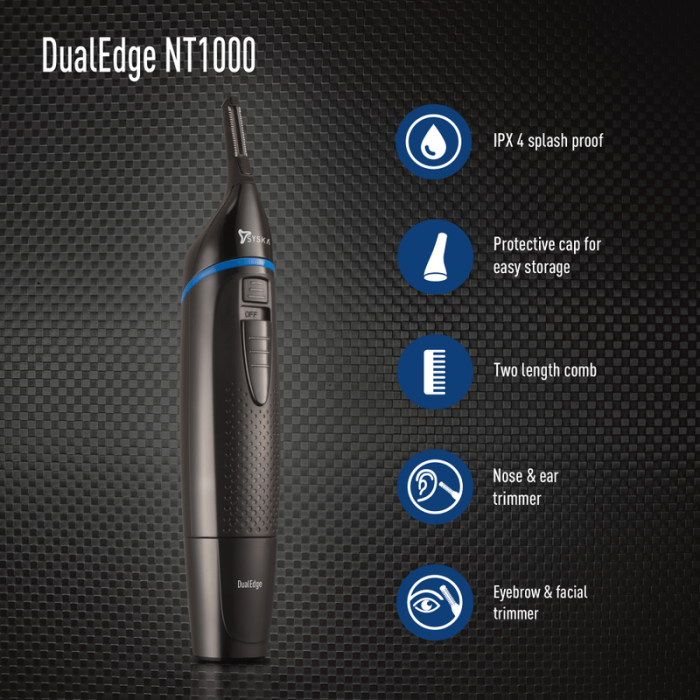 Tackle unwanted nose hair with DualEdge NT1000. This is the first unisex precision trimmer suitable for nose, ear, eyebrow & other facial hair. The bi-directional precision trimming blades ensure no cutting or pulling of skin. The NT1000 hair trimmer comes with 2 adjustable guide combs that will help you trim eyebrow and facial hair at different lengths. The DualEdge nose, ear, eyebrow & facial hair trimmer is designed to remove hard to reach nose & ear hair safely without pulling & eyebrow & other facial hair with any nicks or cuts. This trimmer ensures a safe trimming experience as it guarantees no pulling & the blades are designed in such a way hair will easily get cut. The high-power unisex hair trimmer consists of dual precision trimming blades that will help you trim hair from different directions. This offers you the precise trimming without much effort. This trimmer is 1 AA battery operated, so do not fear of any electric short circuit. No hassles of a cord or any wires to be attached while using. The NT1000 comes in a light weight stylish body. Also the protection cap helps to guard the blades from bacteria, dirt and dust. This comes with washable head. Just remove the head & wash it under the tap for quick & easy cleaning. Leave it to dry for a while & it is ready to be used again. You can also use the cleaning brush to remove all hair or dust.